SANTA VISITS ARE NOW FULLY BOOKED. If you would like to join us at the farm anyway, continue to book below – but there are no Santa slots left. 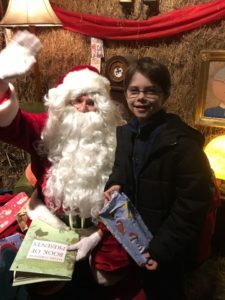 Join us for our annual visit to Bocketts Farm to play and meet Santa. This is a lovely day out to enjoy the farm, animals and play centres and a chance to meet up with old and new SDCS families. Time: Registration at 12noon, then you can stay as long as you’d like. Cost: £12/family ticket: this includes SDCS parents and children and entry to see Father Christmas. Booking: below – please note, no late bookings will be accepted. Payment: Through PayPal upon booking – please include ALL requested information to validate your booking. Please note, when paying, you need to look for the paypal button – scroll down to see it. Santa Visit: Minimum 9 months – Maximum 10 years. Bookings close 30th November, 2018. We have limited places to see Santa so please note places are given on a first come basis. There is a café and restaurant on site, but please feel free to bring a picnic too. Once bookings close, you will receive an email with final instructions for the day and upon arrival you will receive your Santa timeslot. Children at our events are the responsibility of their parents/carers. Please stay with your children at all times.